VOLUMETRIC CINEMA, A video essay by Kevin L. Ferguson. Q: What has making the video contributed specifically to your research process? Did you conceive of it principally as a presentational/expositional object or as an object/process that might generate discoveries of its own for you? A: I do think you are right that my video occupies a more presentational mode, rather than an experimental or investigative one. To me, that distinction is most obvious in that I start with a very traditional “thesis” statement and then proceed by organizing the video into discrete numbered sections. 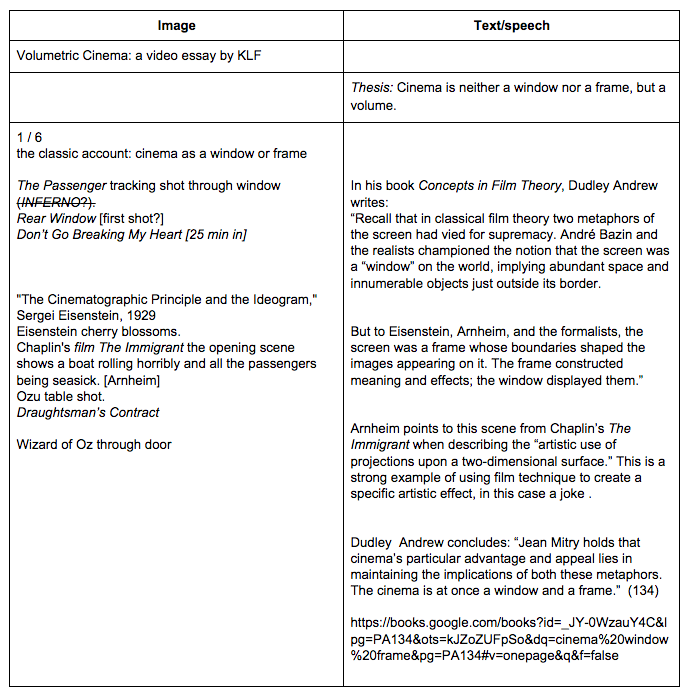 I was also conscious when selecting evidence to try to include examples from different periods, nations, and genres (on the assumption this would strengthen the argument’s applicability to a wider range of moving-image texts). Although I have done some video editing work before (mostly home movies), this was my first attempt at a scholarly video essay, and so I knew just enough to know that if I did not plan well I would only create more work for myself down the line. Thus, my preparation for it involved first writing an outline and then a detailed ten-page script with two columns, one for images I wanted to include and one for voiceover (see figure, left). I revised that a number of times, spent a not insignificant amount of time finding and collecting video clips, did a rough video cut to give myself a sense of timing, recorded the voiceover narration, then went through the video again trimming transitions, creating sound bridges, aligning music cues with visual ones. So, about my process I would say 1) I tried to be very orderly and systematic in the actual creation of the video (which likely means I forestalled some opportunities to generate unexpected discoveries) and 2) I consciously made editing and sound choices that reflected what I imagined to be the norms of presentational video essays. For example: the opening of my video essay fades in to show a very recognizable film history image from Méliès’s A Trip to the Moon (but which should nonetheless appear strange to viewers), that image is rotated 360° on one axis in a familiarly scientific or rational way, and the music cue is from The Wizard of Oz when Dorothy walks through the door to colorful Oz (a scene I also used later), hopefully evoking a sense of wonder or newness. Then the video essay’s title appears and I do not return to that particular sliced volume view until later. So, with that opening, I was trying to create a classic, interesting “hook” to draw viewers in, before going back historically and providing a theoretical frame for my examination of those kinds of computer-generated images. The ending, using The Great Train Robbery likewise follows a similar rhetorical strategy of calling on well-known silent cinema to demonstrate very contemporary methods. Also, pausing and re-rerunning in reverse one shot from The Searchers before cutting directly to the strange, sliced view was an effort to surprise the viewer and create suspense. In sum, I would thus say the structure of my video is fairly traditional (in a literary essay sense): putting the theoretical and historical context first, having equally-weighted sections, placing the specific examples in the middle, concluding with broader future applications, and using rhetorical strategies and conventions to capture and maintain viewer interest. Having said that, even though I was making editing and structural choices that I see as fairly expositional, I did struggle with the sections where I screen-captured my own rotations of the 3D volumes or slices. This is something that has also been difficult when creating single images for traditional print publications: my point is that the volume is three-dimensional, so what is the optimal two-dimensional representation of that? I tend to go with something isometric, although there are choices with perspective that affect how even those appear. The opening clip showing A Trip to the Moon was a simple rotation controlled by the software program, but for the later manipulations, I had to actually rotate three-dimensional objects using my trackpad, which often meant a combination of looping two-finger gestures, pinching, swiping, and riding the up and down arrows. That process was perhaps the most time-consuming, as it required planning out and practicing rotations and zoom ins/outs before recording (and then, often on my stuttery laptop, removing laggy frames to make the movement look fluid). Some of the jitteriness is still apparent in the Vertigo cube, and you can see how in the next examples I used a split screen (hopefully) to clarify for viewers the relationship between the rotation and the “original” scene. So, while not aforethought, trying to envision and capture the ideal perspective view of these film volumes did force me to consider how I was arguing that these three-dimensional volume views were radical at the same time as I was working to present them in familiarly legible views. I have likened this feeling before to watching while someone else plays a video game: while the video essay is an improvement on the verbal description, for my case it still does not provide the understanding of play and manipulation with the 3D object itself. Future research for me involves modeling and 3D-printing some of these volumes. That work is less expositional and more experimental, and fumbling with unfamiliar software has already led me to interesting deformance and discovery.